Help Give Tanker a Second Chance! Tanker finally caught a break… he was adopted! Except it didn’t last and he was found on the streets of Texas, scared, starving, and in desperate need of medical attention. 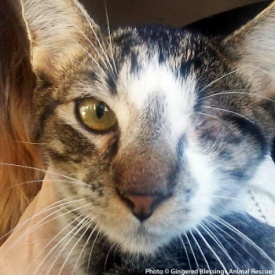 Tanker is now in urgent need of surgery to repair a wound where his eye had been removed. Then he can heal and have another chance at finding a loving home! Tanker’s surgery has been funded – thank you!